NGC 6188 is a large emission nebula located some 4000 light years distant in the southern constellation Ara. This giant molecular cloud is being illuminated by the young star cluster NGC 6193 which in this image appears in the upper centre, almost as if suspended above a cloud of dense nebulosity which forms a great wall across the field of view. The cluster belongs to the Ara OB1 association and is very young, not older than 3 million years, and contains some 30 stars. At the centre of the cluster lies an intensely bright pair of stars; the O-type giants HD 150135 and HD 150136. The latter is in fact itself an extremely close binary with a confirmed third component in an outer eccentric orbit of between 2950 and 5500 days. This triple star system is one of the most massive in our galaxy with the three components containing 64, 40 and 35 solar masses respectively. The intense radiation from the massive stars is slowly eroding the surrounding gas and dust away, sculpting it into the striking forms seen in this image. Within these clouds new stars are currently being born and in some places have already begun to light up the nebulous clouds from within. The intricately shaped dust and gas provide for a stunning interplay of light and shadow throughout the area and the entire scene is littered with thousands of dimmer stars in a multitude of colours. Especially in the lower part of the image several long shadows can be seen cast by the glowing protruding dense portions of the nebula. 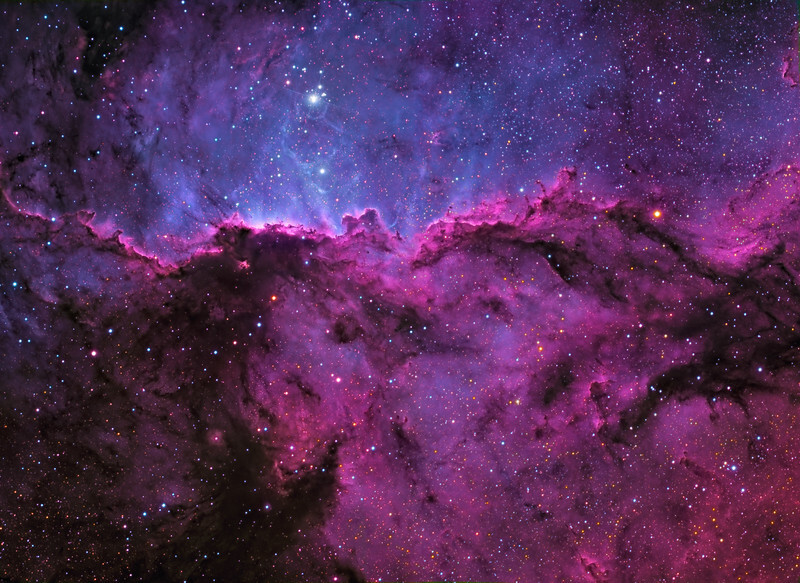 In many places giant clumps of material can be seen extending from the glowing clouds, reaching in the direction towards the NGC 6193 cluster. With the surrounding clouds slowly eroding away these denser structures will eventually emerge to resemble other more mature examples such as the famous "Pillars of Creation" in the Eagle Nebula. This image is a mosaic of two fields, each constructed from exposures in three very narrow (3nm) wavelength bands corresponding to the emission profiles of ionised Hydrogen, Oxygen and Sulphur. The combined images in each filter were assigned to their natural colour channels using a PixelMath expression in PixInsight. This enables a synthetic 'natural' colour image to be created from the narrowband data.